TableSetter is a Ruby app that provides an easy way to present CSVs hosted locally or remotely (e.g. on google, etc) in custom HTML. TableSetter in the wild: a list of all stimulus projects from last year, the stimulus spending progress, or a list of failed banks due to the last recession. Each table is filterable and sortable on multiple columns. Also each column can be formatted in one of many different styles. In production mode, TableSetter provides valid expires headers and can be coupled with an upstream cache like Rack::Cache or varnish for speedy presentation. After you've installed the gem you'll have a new executable: table-setter. You can view the subcommands available by typing table-setter --help. To set things up you'll need to run it with the install command to install the configuration files and ERB templates into a directory. Go to development url, http://localhost:3000/ and you'll see a list of the example tables. You can peruse the examples here. install <DIRECTORY> installs the tablesetter files into the current directory or one you specify. start <DIRECTORY> starts the development server so you can preview your tables before deploying. The config.ru file is a rackup file that instructs the webserver to start the TableSetter application and serve the assets contained in the configuration folder. In most cases you'll want to use apache and passenger (see Deployment for details). The images directory contains the small images and which show the user the sorting direction of a given column. jquery.tablesorter.js the jQuery tablesorter plugin that handles the dynamic sorting by column. jquery.tablesorter.pager.js the tablesorter pager plugin to tablesorter that provides the paging functionality. The stylesheets directory contains application.css, the TableSetter stylesheet. Each style is prefaced with #tablefu so you should be able to include your organization's css on the page without affecting the tables. example.yml contains most of the simple options in a TableSetter file. example_local.yml and example_local.csv shows how to build a table from a local file. It also is hard_paginated (see A Table Setter File). example_faceted.yml is an example of faceting. example_formatted.yml and example_formatted.csv shows how to apply formatting to a column and a group of columns. The views directory contains the ERB templates needed to render the table pages and index page. 404.erb and 500.erb render when a table is not found or a server error occurs, respectively. layout.erb contains the basic frame of the page. You should place most of your customizations here. If you'd like to add custom html, place it above or below the <%= yield %> tag. index.erb renders the table list for the root path of the app. table.erb renders an individual table. You shouldn't have to tweak this much, if at all. Each TableSetter file is written in YAML and outlines the the display options for a particular table. The filename dictates the path where it will appear (e.g. a config file named example.yml will appear at http://host/example). Initially TableSetter installs a few examples to get you started (see above). # google_key:, file:, or url: define how a table is loaded. file: loads a local CSV file from the /tables directory. 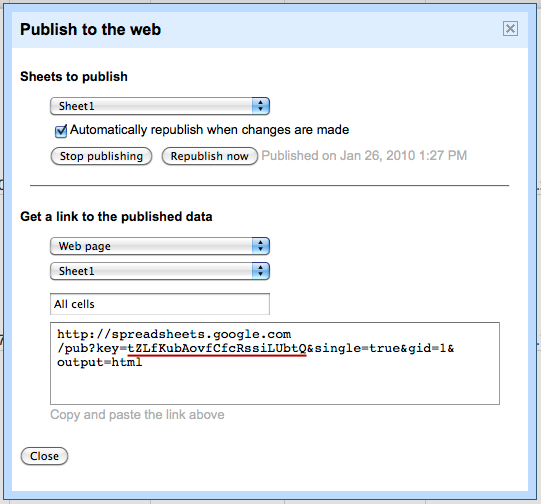 google_key: is a google key url from an external google doc (see note). deck: A HTML string describing the table, appears above the table itself. footer: A HTML string for notes/caveats etc. Appears below the table. Bank: 'text-align:left;' # would left-align the text in the "Bank" column. sorted_by: # Defines the sort order and column to sort by of the table. total: # Declares which columns should have a totals row. formatting: # Defines which of the TableFu formatters to apply to a column. (%) Spent: bar # applies the bar formatter to the '(%) Spent' column. per_page: 250 # Instructs TableSetter to only page by 250 rows. # set to false the table is still accessible directly. You probably don't want to parse a remote CSV file on every request in production, so the config.ru file contains directives to enable Rack:Cache a simple reverse proxy cache. If your web server is not behind an upstream cache you'll want to enable it by uncommenting the required lines. That line dictates the max age of a request and you'll want to tweak it depending on how frequently changed your tables will be and how many users you expect. If you want to define any TableFu formatters you should do so in config.ru. The build tables will be placed in the out directory inside the configuration directory. And upload the files in the out/tables directory. In your existing Rails app path and it will install the TableSetter routes, controller, views, and Table model. A gem that provides the conceptual backend to TableSetter. The Passenger Documention section on how to deploy a rack app under passenger. How to deploy a rack app in heroku. The github issue tracker. Post bug reports and feature requests here. The YAML homepage. TableSetter config files are YAML files. A state by state breakdown of legislative challenges to health care reform. A table showing leniency rates of Chicago area judges in speeding cases. A set of fabric deploy scripts for deploying TableSetter to s3. Jeff Larson (Maintainer), Brian Boyer, Scott Klein, Mark Percival, Charles Brian Quinn, Christopher Groskopf, Ryan Mark, Ben Welsh, and James McKinney. Switch to https for google key. Updated config.ru to fix the same bug in 0.2.8, you'll want to regenerate your template. Fixed a scope bug for 1.9.1 when Rack::File is around. 404 and 500 pages have no layout now, please update your templates accordingly. Fixed a bug in table-setter start thanks to John Keefe merged in some more changes from James McKinney and added a lib/formatters.rb in the template, which is the standard place to stash your custom formatters. Also, the build command now errors loudly and exits if there's an error. Loads of bullet-proofing from James McKinney and js fixes from Ben Welsh, you'll want to re-run table-setter install to grab the changes, as with previous releases. Fixes encodings issues and the FasterCSV name change for ruby 1.9. Fixing long standing bug with empty prefixes in the build command. It's recommended not to use this version. 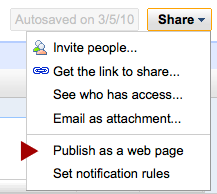 Backwards incompatible change: Table urls no longer end in a trailing slash. Please modify the url_for calls in your templates to reflect the change.